New Jersey has always had a rich history of glassblowing. In 1739, The first successful glassblowing studio in America was founded in New Jersey. The local beaches with their generous deposits of fine silica sand, along with plenty of forests for fuel made New Jersey the prime location for more glassblowing studios than any other state. 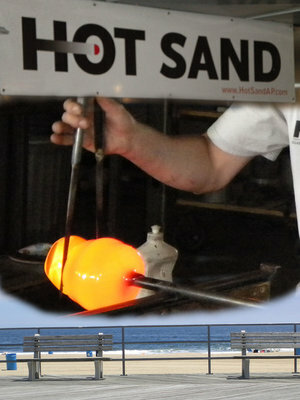 Keeping with this tradition, Hot Sand was founded in 2007 as New Jersey's first public access glassblowing studio, opening on Ocean Avenue in Asbury Park, NJ. 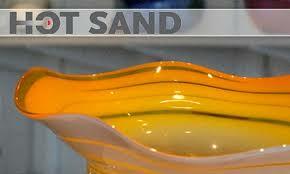 Owners Paul Elyseev and Thomas Stevens started Hot Sand as a home to create their own artistic pieces and share glassmaking with the public. Our walk-In glassblowing started with the now well-loved QuickCast experience during the summer season. Now a year-round business, people from all walks of life can walk in off the street and choose from a variety of fun objects on our Walk-In Menu including the Blow-A-Drinking Glass, the Paperweight, Blow-A-Ornament, Blow-A-Heart, Blow-An-Egg, Blow-A-Bubble, Blow-An-Apple and you can even Blow-A-Pumpkin! In 2011, just months before SuperStorm Sandy hit, Hot Sand made the propitious move from its original Boardwalk location to the busy, blossoming Asbury Park Downtown district. 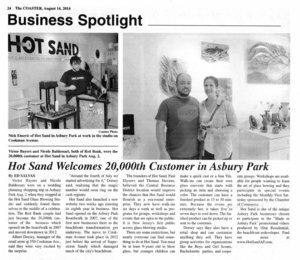 Located currently at 550 Cookman Avenue, Suite 103, Hot Sand enjoys being one of the many aspects of our city that makes Asbury Park such an enjoyable place to visit, live, work and love.